For starters, none of them used Kickstarter or Indiegogo and none of the startups existed before they started a crowdfunding campaign. Nighttime Amsterdam. Credit: Stefano Montagner. De Correspondent, Krautreporter and El Español. In the past, we’ve called them The Big 3. They hold the distinction of being, as far as we can discern, the only crowdfunding campaigns to raise more than a million euros in seed money for news startups in the history of journalism. Editors of the Dutch, German and Spanish news startups spoke within a couple days of each other this spring to talk about what worked and led their campaigns to such a potent reaction. For obvious reasons, we wrote about each of them. Krautreporter: Crowdfunding journalism is a movement and it’s happening now. Here are some of the things all three crowdfunding campaigns had in common. El Español worked with a local Spanish crowdfunding platform while both De Correspondent and Krautreporter made their own platforms. De Correspondent’s platform was made to emphasize the number of people who gave to the campaign and de-emphasize the amount of money raised. Organizers of the campaign made it clear early on that they needed 15,000 backers to pay an annual subscription of€60 in order for them to have the seed money they needed to get started. Krautreporter used a thermometer-like visual that stretched across the entire page to count from 0 to 100 percent for their campaign to raise €1,000,000. They would later regret that decision, saidKrautreporter’s Frederik Fischer. People are most likely to back campaigns they think will succeed, and visualizing the ascent from zero to one million euros can look like a steep, slow climb, especially after the rush of excitement and funding ends after the first couple of days and you reach what Fischer calls the valley of death. Before launching their crowdfunding campaigns, De Correspondentand Krautreporter hadn’t published a single story. Technically El Español began to publish some stories during their campaign but it was sort of a soft launch, by no means intended to reflect the full experience readers could come to expect from El Español. As important as a tangible product may seem, there are more important things to consider, said De Correspondent co-publisher Ernst-Jan Pfauth. “People who back journalism projects aren’t in it for ‘a deal’; they’re in it because they want to support something they deem important,” he said. Yes, journalists are losing jobs and job security. Yes, it may impact democracy and society at large. Yes, it’s important. Do readers care? Maybe not, certainly not enough to make it the hinge of a crowdfunding campaign, Pfauth said. 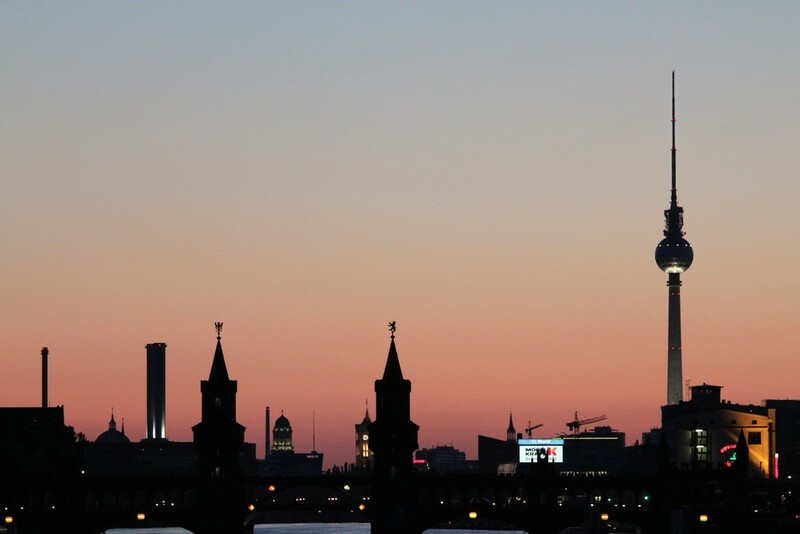 Berlin skyline. Credit: Der Robert. Find the pain of an audience or community, Fischer said, the real pain, then seize the opportunity to be of service. El Español tapped into discontent with authority in Spain and promised reporting from prominent, independent journalists. Both De Correspondent and Krautreporter believe the pain they identified was news that doesn’t chase trending headlines or suffer from influence by advertisers. “We don’t need a travel or career section, just because advertisers like those. We don’t need to hunt for page views. We don’t have to compete with huge social networks for ad budgets. And most importantly: we don’t have to turn our members into a ‘target group’. This might be a good time to mention that a few similarities shared by De Correspondent and Krautreporter should come as no surprise since founders of both news outlets spoke openly with each other before their campaigns. Each campaign was about attracting an initial audience, not just money. It’s a good idea to make your campaign about more than money, to make people feel like they’re a part of something bigger, Pfauth said. “…please, please remember that you’re not starting a publication, you are starting a movement,” he said. Crowdfunding journalism is “a bigger movement, a European crowdfunding movement that is really, especially in the last months, booming,” Fischer told an audience at the International Journalism Festival. 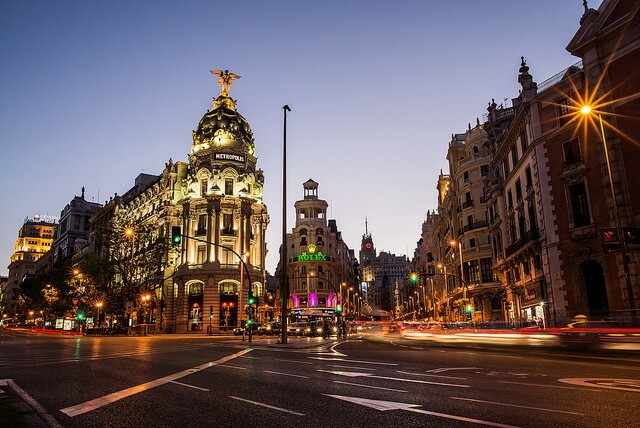 Downtown Madrid. Credit: Fernando García. Popular journalists add to the narrative behind the campaign and may lend trust to the venture. They also attract national media attention, the kind all three projects enjoyed in their respective countries. De Correspondent was announced on the most popular talk show in Holland in 2013. Pfauth and co-founder Rob Wijnberg used to work for the large Dutch media company NRC Media. In a recent CJR article, El Español editor Pedro Rámirez was called “probably the greatest Spanish (and European) journalist of the past 25 years.” He comes to the startup from El Mundo, the second largest paper in the nation, while co-founders of El Español publisher No Hace Falta Papel both came to the news startup from El Mundo, the largest newspaper in Spain. Sebastian Esser and Krautreporter executive leadership also have a history of working for reputable news organizations, as did freelancers who were involved with the campaign. Alternative is a word often found peppered throughout crowdfunded journalism. These campaigns are no different. De Correspondent and Krautreporter both promised that for 60 euros a year you get an independent, ad-free experience. You get to join a community, go to exclusive events and be part of a more inclusive reader-reporter relationship. Both publications look to their readers to be sources and to be more involved than reading and sharing in social media. El Español went a step further, allowing readers to buy shares and become investors in their equity crowdfunding campaign. Through the Cracks tells the stories of projects, reporting and start ups made possible through crowdfunding. \mä-dərn ‘jər-nə-list\ : a person engaged in gathering, verifying, editing, organizing and sharing useful information for a public audience; especially : one who adapts to the use of new technology to tell stories.